Logos help communicate your business brand to your Clients, and are a great way to make your Invoices and Estimates stand out from the rest! 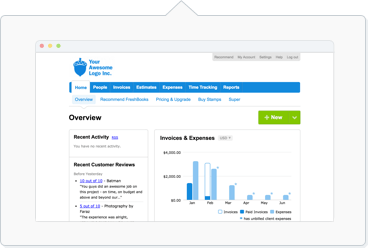 You can easily add logos to your Invoices and Estimates in FreshBooks. There are two different templates for both Invoices and Estimates, which give you two different logo options (a small one or a banner). All you have to do is create an Invoice/Estimate and upload the logo once (on each template). Then every Invoice or Estimate you create will automatically re-use your saved logo moving forward. To change the template, you can click on Customize Invoice/Estimate Style under Settings on the right. Click on the select a file link to upload a file, or you can drag your logo into this space. Accepted logo formats include JPEG/JPG, PNG or GIF. The logo will be the actual size of the file if it is less than 266 by 200 px, or image will be scaled proportionately to fit this. Click on the select a file link to upload a file, or you can drag your image/logo into this space. The banner space for a wider logo is 778 x 200 px. If the image width is different than the full width of the Invoice/Estimate, it will be scaled up/down until it fits the width. You can reposition it vertically within the frame by dragging the image.